The set comes in nine numbered bags, plus an unnumbered bag of the largest parts, an instruction booklet, and a sticker sheet. (I tend not to use stickers when I build LEGO® sets so you won’t see the stickers in my pictures.) In recent years, LEGO® has made the sets easier to build by shortening the amount of time needed to find pieces with these numbered bags, which is certainly preferable to making the build easier with fewer, bigger pieces. More recently, LEGO® has also spread the minifigures out across more bags, so you don’t have all the characters until near the end of the build. The less-recognizable Kanjiklub members show up first, followed a few bags later by Han and Chewie, then Finn, then BB-8, and finally Rey. While the same Rey appears in another Force Awakens set, BB-8 is available in a different set, and this version of Chewie is available in two previous sets, Finn, Han, and the two Kanjiklub members are unique to the Falcon set. Looking at the exterior first, the unique shape of the Falcon is modeled well. The landing gear are solid and integrated, so they aren’t going to come off when stopping for emergency repairs. The ramp opens to the interior accurately. The engine is represented fairly well with a piece of translucent blue tubing just begging for the addition of custom lighting. The quad laser turrets are present on top and bottom, and while it’s not shown in the instructions, you can push two of each set of four barrels further in to depict the recoil action shown in the movies. The set does a good job of representing the interior; once you peel back the twelve hinged roof panels, there’s a spacious back including seats around a dejarik board, medical couches, a computer terminal, and smuggling space. There is space for two gunners, although instead of being seated in a movie-accurate way the figures are loaded back-to-back into a sled and inserted into the center of the Falcon. The cockpit seats two minifigures, not four, and the copilot sits a stud behind the pilot, as has been the standard in recent LEGO® Millennium Falcon models. Inside and out, this model of the Falcon could really fit the original Trilogy or The Force Awakens except for the rectangular dish which sometime after Return of the Jedi must have replaced the round one scraped off inside the second Death Star. By my count, LEGO® has released at least 8 Millennium Falcon sets, plus several tiny iteractions in Advent Calendars. Where does this set stack up? 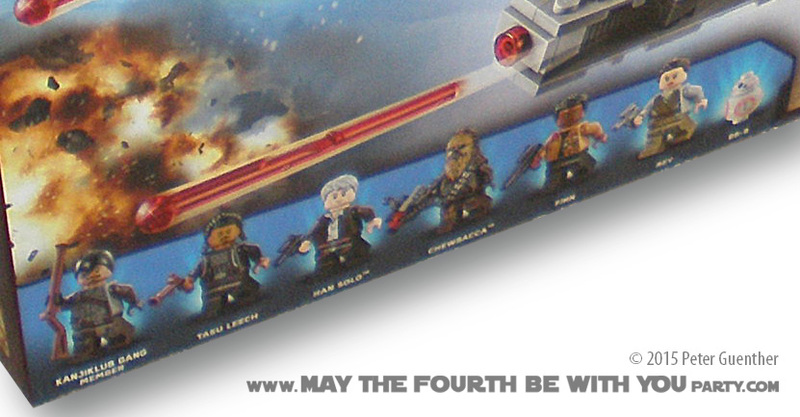 Three of the sets were smaller than minifigure scale; the rest, like this one, were meant to accommodate the traditional LEGO® minifigures inside. In piece count, this is the second largest Falcon, second only to the $500 Ultimate Collector’s Series Millennium Falcon, which now commands upward of $3500 for a sealed set. While people often complain that LEGO® sets have gotten too expensive, according to Brickset.com this set comes in at 11.3 cents per piece compared to 15.1 cents per piece for the original 2000 release. Admittedly, that set had some large pieces; this set is a better building experience, more pleasing to the eye, and more appropriately LEGO®-looking without them. In terms of detail and authenticity, this and the 2011 release are very similar, although the previous set, number 7965, has the dish from the original trilogy. Both sets are highly detailed, pretty authentic, and pleasing to the eye in ways the original two minifigure releases were not. Playability: This is a great set for kids with lots of action features including a couple of spring-loaded shots. Kids will enjoy all the space inside to tell stories with the figures and the strong build which is very swooshable (for stronger kids at least). Accuracy: While this set doesn’t capture every detail of the Falcon in a photographic manner, it’s a reasonably accurate model of the ship. Adult collectors should feel comfortable displaying this model as The Force Awakens Falcon or, with a few modifications, the original trilogy version. Challenge: For an experienced adult builder this is not a difficult build; there are a couple steps where a few pieces could use some additional support while adding pieces, but there’s nothing truly challenging or even unusual in the build. For children, this set is a big project which requires attention to detail; the recommended age minimum of 9 seems appropriate although advanced younger builders or younger builders with adult help would do fine. Value: At $150 it’s not cheap, but for the piece count, the unique figures, and the solidness and accuracy of the model, it’s still a good buy. You can also check out store like Target, Toys R Us and Walmart for availabilities. ← Is there Crying at Star Wars?